Designing a room for boys can be a simple project or a very complicated project. It really depends on the boys that are going to be living in there. If you are decorating for two boys, hopefully they will have relatively the same tastes so that your project doesn’t become a nightmare. For younger boys you can usually direct them to more neutral paint colors and decorations. As the boys grow older they will want to try out their favorite characters and colors as well as being influenced by their friends’ rooms. For boys bedroom colors are usually blues or greens, sometimes gray or tan. You should try to avoid using very dark shades but it is possible to use a bit of darker colors to contrast. When you use a dark color keep in mind that when you want to repaint you will need to use a primer to cover the color or you will need a paint that can cover without millions of coats being needed. Many times younger boys are happy with a lighter shade of blue or green. The bedroom design gives you many options. You can choose decals or different types of paintings to enhance the look of the room. Many times you will be able to create the boys own little world where they can play and entertain their friends in comfort. The beds that will be used will rely heavily on the ages of the boys. 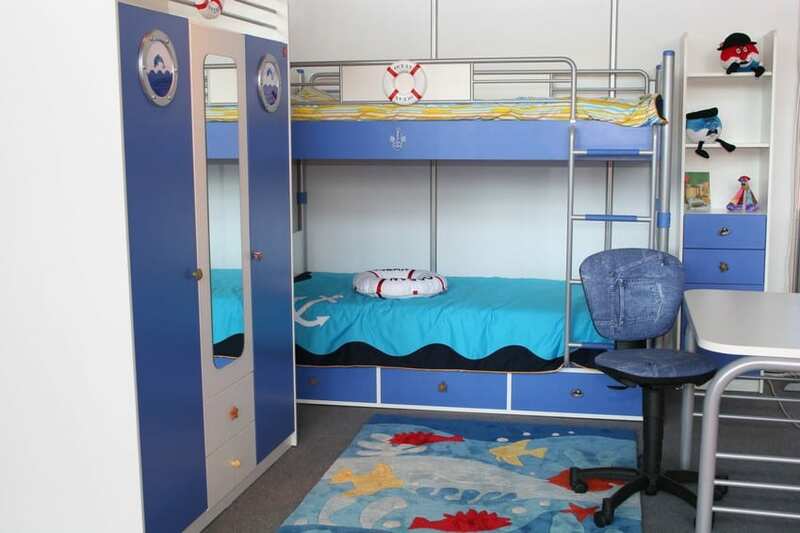 For many boys between the ages of 5 and 13, bunk beds will be acceptable to them. Younger children should have a rail on the top bunk to avoid them falling out of bed however. Trundle beds are also an option. If the room is big enough it will be able to house two twin beds without any problem giving the boys their own space. Teenagers will likely want their own rooms and many request a big bed. For them when space permits you can provide a king size bed that will allow them plenty of room. The design of the room is usually based on the size of the room, so it will be important to remember that key factor when choosing furniture, pictures, beds and so on for the room. A total redesign of a bedroom can be a major remodeling project. It is important to keep sight of the project and remember that you will likely need the boys to be able to use the room for at least sleeping while you complete your project. Start early in the day so that the paint fumes will be gone by bedtime and make sure the boys understand what you are trying to do. If possible involve them in the project. Kids love to help with projects such as this. Just be prepared for them to become bored and wander off in the middle of the project. Attention spans are not very long in kids of any age. Once you have decided on the theme for the room, make sure you can find all of the decorations and things that you will need. Many times bedroom furniture will need to last for many years so it important that the furniture is able to grow with the child. Dressers and nightstands should be made of sturdy wood and construction so that you don’t find yourself replacing them every year.